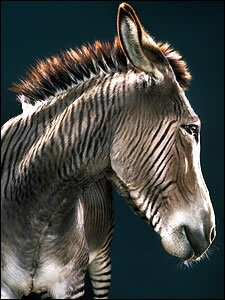 Zonkeys Are Pretty Much My Favorite Animal Napoleon Dynamite was on to something. Hybrid creatures like pizzlies, blynxes, and bonanzees are beautiful and cool - and they're forcing evolutionary scientists to rethink the web of life. A FEW MILES FROM THE ENDLESS MALLS and garish tourist attractions of Myrtle Beach, South Carolina, there's an exotic-animal preserve that houses a group of four-year-old liger brothers named Hercules, Zeus, Vulcan, and Sinbad. Ligers, the offspring of a lion father and tiger mother, are the world's largest cats, weighing up to half a ton each - double the heft of either parent. They're hybrids, and you won't see them in accredited American zoos, which look askance at letting different species breed. But that's how it is with hybrids: They don't get much respect and they're easy to miss, even when they're right under your nose. And yet, when you start looking around, they're everywhere. Zorses, wholphins, tigons, and beefaloes. Lepjags, zonkeys, camas, and bonanzees. These are some of the captive-bred mammalian hybrids that exist, and they're joined by a host of hybrid birds, fish, insects, and plants. Thanks to new techniques that allow scientists to isolate and compare DNA, more hybrids are turning up every year, and we're learning that some of them-such as the pizzly, a cross between a polar bear and a grizzly-can occur naturally in the wild. Hybrids evoke wonder and fear, magic and folklore. Their very existence unsettles our concept of what's out there, now and in the past. In fact, scientists are currently debating the extent to which hybrid breeding may have occurred during the evolution of man. Some contend that interspecies hanky-panky between humans and chimps-resulting in, yes, "humanzees"-went on for a million years or more after the two species split off from a common ancestor. Even now, there may be ghostly traces of this forbidden genetic lambada in our chromosomes. Sound hard to believe? That's the hybrid calling card. They strain credulity-even when they're staring you in the face. I first meet Antle at the fenced-off preserve on a cold, wet January day. Inside a safari-themed lodge used to greet visitors who pay for private tours, he shows me recordings of his numerous media appearances and movie gigs. He's provided animals for such Hollywood films as Ace Ventura: When Nature Calls, Forrest Gump, and Dr. Dolittle. Antle's exotic-animal career just sort of happened after he started working at a health clinic affiliated with the swami's ashram, Yogaville, in Buckingham County, Virginia. In 1982, a visitor to the clinic gave Antle a tiger cub. Later, another visitor-one who worked for "tiger in your tank" Exxon-asked him to lecture on health issues, cub in tow, at a company gathering. By the mid-eighties, Antle had become a full-time exotic-animal guy, breeding and training large, charismatic species for exhibition and rental to the entertainment industry. To his astonishment, a few years later, his male lion Arthur successfully mated with one of his tigresses. 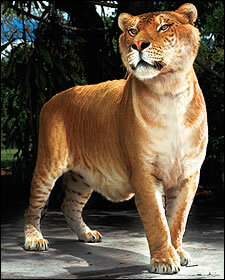 A second liger litter arrived in 2002. A movie that Antle had nothing to do with made ligers famous. In 2004's geek-glorifying Napoleon Dynamite, Napoleon sketches a liger in his school notebook and declares, "It's pretty much my favorite animal ... Bred for its skills in magic." Antle, one of the few liger owners in the world, did the rounds with Anderson Cooper and Matt Lauer. "We had such a big splash of exposure," he says. "We saw the valuable public appeal. It was like opening a chapter of myth that had come to life." After Antle finishes showing me around, three of his assistants appear on the lodge's deck with Sinbad. 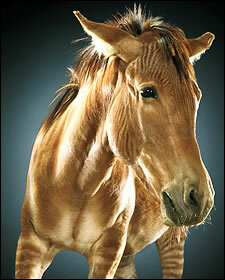 The supersize beast has lighter stripes than a tiger and a lion-shaped head with no mane. His arms look stubby and his pectoral muscles are sagging. As we watch through a glass wall, a woman offers a chunk of meat from atop a platform, to make Sinbad stand and show off his 12-foot frame. The assistants guide him around using chains and a baby bottle, and then Antle invites me out for a closer look. He walks up and snuggles Sinbad's muzzle. "Hi, bud," he coos, as if he's playing kissy-face with a kitten. Sinbad could remove Antle's head with a single chomp, but I'm more enchanted than scared. It's like seeing a Sasquatch or centaur in the flesh. "In our core belief, people don't want to accept the idea that two distinctly different-looking wild animals can reproduce," Antle says. 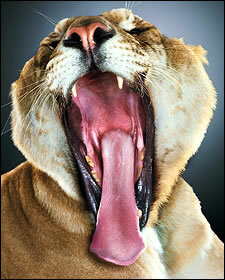 "Ligers make people understand that hybridization is real."